Randy Scott Holman was born September 18th 1958 in Santa Paula, California. The six foot one right hander attended Ventura College where he was signed as an amateur free agent by the New York Mets in 1976. 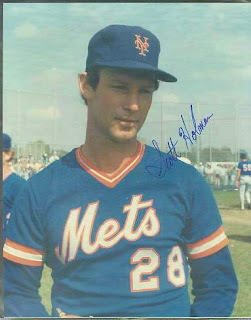 Holman spent four years in the Mets minors, impressing at AA Jackson in 1978 with an 11-5 record. 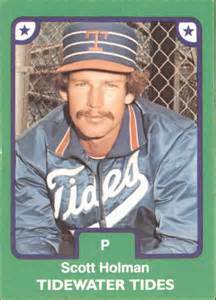 He was promoted to AAA Tidewater in 1979 leading the staff in wins (13) going 13-7 with the clubs second best ERA (1.99). 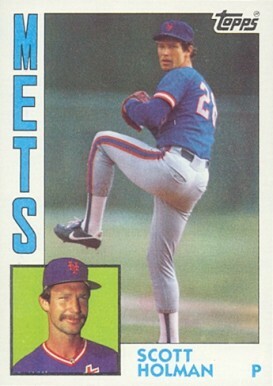 After just 11 games due to arm issues in 1980, he was still promoted to the Mets staff as a September call up. Holman made his MLB debut on September 20th, pitching the 5th inning of a 9-5 win at Three Rivers Stadium in Pittsburgh. He made four appearances posting a 1.29 ERA. In 1981 he was back with AA Jackson going 4-9, then back at AAA Tidewater in 1982 going 10-8, second in wins behind Steve Ratzer. In 1982 he got another September call up. On September 17th he got a start in the second game of a double header, but he gave up four runs to the eventual World Champion St. Louis Cardinals in four innings, taking his first loss. On September 22nd, he got another start & earned his first career win going into the 8th inning at Wrigley Field in a 5-2 Mets win. On September 27th, Holman had his best game pitching a complete game win over the Pittsburgh Pirates, allowing just one run striking out four. That year he was 2-1 with a 2.36 ERA, in four games, being labeled as one of the Mets most promising arms. In 1983 he was with the Mets most of the season, but things did not work out, he went 1-7 earning his only win in Los Angeles beating the Dodgers 4-2 pitching 8.1 innings of that win. In 1984 he was back in the minors as the Mets staff featured young stars like Dwight Gooden, Ron Darling, Sid Fernandez as well as starters Ed Lynch, Walt Terrell & Bruce Berenyi. Holman went 7-13 at AAA Tidewater posting a 4.18 ERA. The Mets gave up on him, possibly due to reoccurring shoulder issues & he was released. In 1985 he pitched his last season going 0-10 at AAA Iowa in the Chicago Cubs organization. In his three year career he was 3-8 with a 3.34 ERA, 58 strike outs with 60 walks in 134 innings in 43 games.